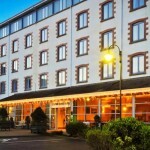 The Alcock and Brown hotel is a boutique style, family run business located in the heart of Clifden town, in scenic Connemara on the western shores of Ireland. Centrally located, The Alcock and Brown is perfectly situated for you to explore the Clifden and the wider Connemara region. The Alcock and Brown hotel offers a choice of Superior and Standard rooms impeccably presented for your stay. The Clifden Station House Hotel is a modern 78 bedroomed hotel set around the old Clifden Railway Station at the entrance to Clifden Town. 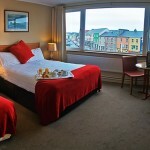 Its the ideal base to both enjoy the town and also explore the whole Connemara region and its many tourist sites. The hotel has an award winning Spa & Leisure Centre located adjacent to the hotel with direct access from all bedroom floors. It boasts an 18 metre deck level swimming pool, Jacuzzi, Swedish steam room, purpose built sauna and fully equipped gymnasium. 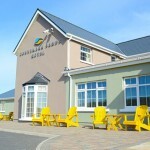 Connemara Sands Hotel is one of very few beachfront hotels on the west-coast of Ireland. Located 10 km South of Clifden, it is situated next to the Blue Flag awarded, white sandy beach of Mannin Bay. Enjoy the stunning views across the aquamarine ocean that would rival any beach worldwide. 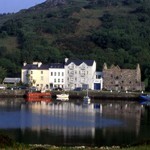 Foyle’s Hotel Clifden, Connemara’s longest established hotel, situated in the picturesque town of Clifden, has been owned and managed by the Foyle family for nearly a century. This impressive building, which has played host to many famous personalities over the years, has recently been redesigned to the highest modern standards, yet retains much of its old charm and atmosphere. Built for the Harbour Master nearly 200 years ago, The Quay House has been sensitively restored and now offers guest accommodation in fourteen bedrooms (all different) with full bathrooms – all but two overlook Clifden Harbour. 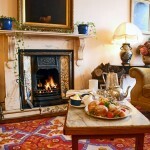 Family portraits, period furniture, cosy fires and a warm Irish welcome make for a unique atmosphere of comfort and fun. The owners, Paddy and Julia Foyle, are always on hand for advice on fishing, golfing, riding, walking, swimming, sailing, dining, etc – all close by.